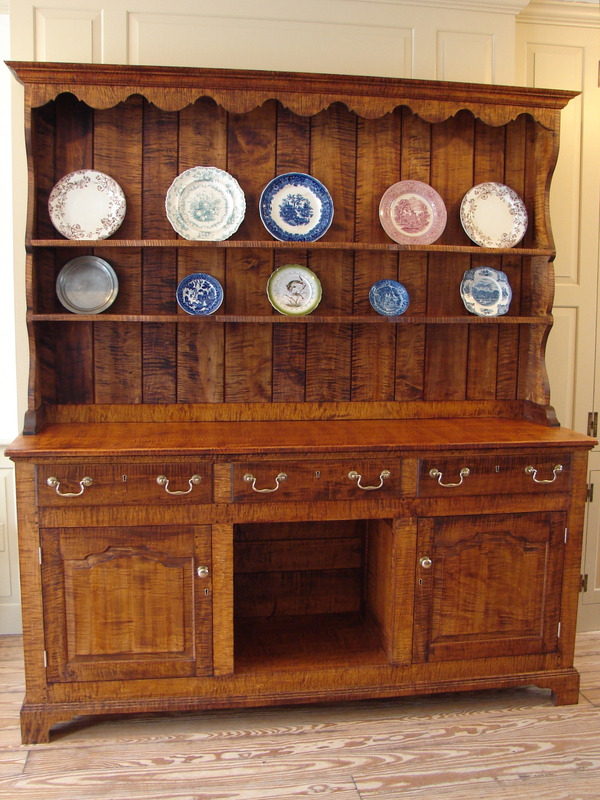 Earlier this year I made this “Welsh dresser” for a person in Philadelphia. 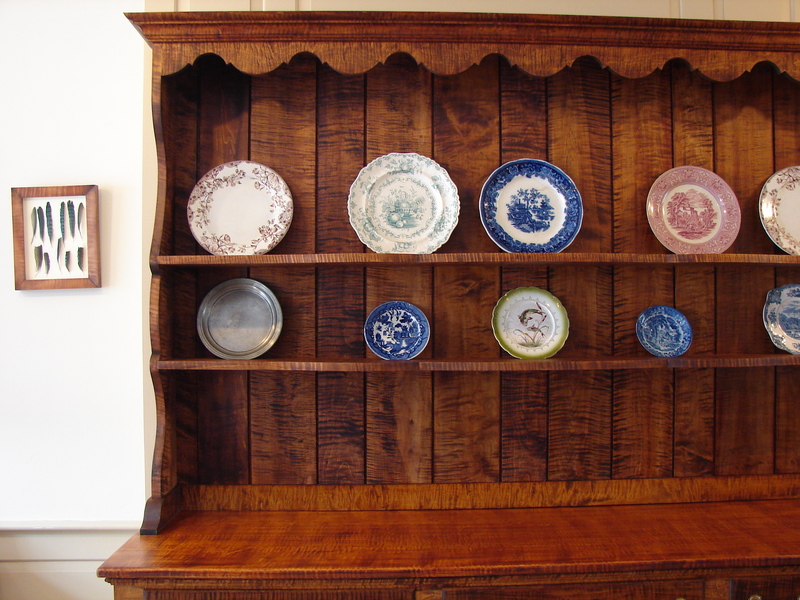 A Welsh dresser is kind of a catchall phrase here. 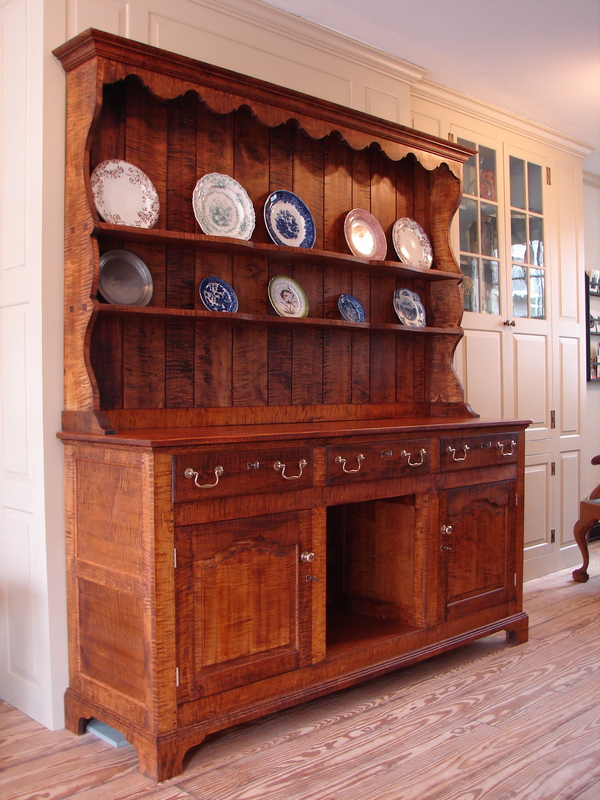 It usually refers to any number of designs for kitchen storage, work, and display above and bellow. This design has a plate rack, three lockable drawers, two lockable doors and a center opening, sometimes called a kennel. The monolithic piece is made of curly maple, a grain which causes the wood to shift color from dark to light depending on how the light is shining. Here it has been stained to a warm amber color. The effect is quite beautiful as the sun changes the light in the room throughout the day. The lower section is a frame and panel construction with pegged mortise and tenon joints. 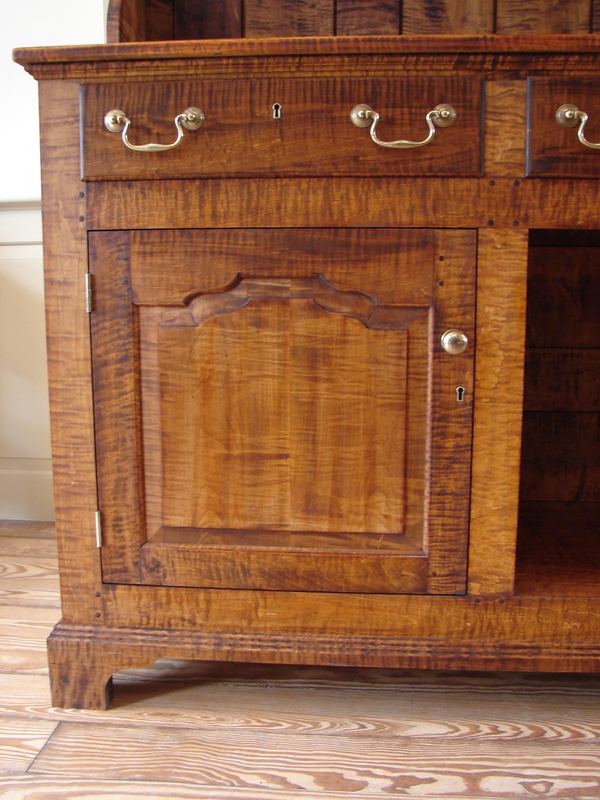 The lipped drawers are made with hand cut half-blind dovetails . Hand carved tombstone panels liven up the doors. Grain and color of each board was carefully considered to give a unified facade. On top there are gently shaped shelves for plates and glasses. It is held together with hand cut dovetails and through wedged mortise and tenons. A carefully matched scalloped valance and crown molding top it all off. This entry was posted on May 18, 2013 by antickcabinet. It was filed under custom built-in, custom cabinetry, custom furniture, Lambertville NJ and was tagged with cupboard, curly maple, custom built-in, custom cabinetry, custom furniture, custom furniture lambertville, furniture designer, half-blind dovetails, hand cut dovetails, hutch, mortise and tenon joints, plate display shelf, plate rack, tiger maple, tombstone doors, welsh dresser.